At Enterprise Connect, Crestron will showcase its unified communications and room scheduling solutions designed to solve the conferencing, presentation, collaboration, and room scheduling challenges that face IT decision makers. Crestron solutions support and integrate with key Microsoft products and platforms while providing a consistent user experience, enterprise-grade network security, cloud-based provisioning and management, the ability to leverage existing infrastructure, and a unified scheduling platform. Live demonstrations will be available at Crestron Booth 629, March 12–15, in Orlando, FL. 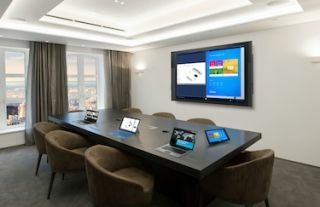 Microsoft Teams for every space: Crestron enables users to run Microsoft Teams in huddle spaces, conference rooms, and open spaces. Network room scheduling: Crestron provides enterprises with the flexibility to directly connect to whatever calendaring platform is already in place, such as Microsoft Exchange and Office 365, and natively run any room booking program including Robin Powered, EMS, Appspace, or Teems. Crestron XiO Cloud: Built on the Microsoft Azure platform, XiO Cloud is designed to reduce installation time of Crestron AV devices by up to 90 percent. Crestron Mercury: An open UC solution that natively runs Zoom Rooms and works with Microsoft Teams, Cisco WebEx, Skype for Business, BlueJeans, Slack, GoToMeeting, and other leading UC applications.